Many times a menu is disregarded as a great marketing model. That is exactly what it is. It is the brochure for your restaurant. The more you can persuade customers to try a certain dish, the more you are likely to sell more of that item. Also, your menu can be combined in a direct mail campaign or advertisements. 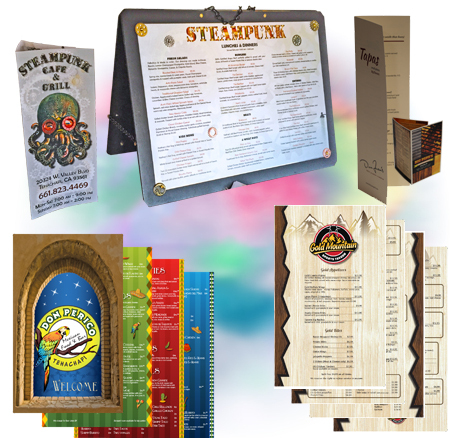 We want your menu to whet your customers' appetite, so we print our menus on high-quality thick 100 lb. gloss text with a glossy sheen on both sides. Lamination of your menu is also available. Menus are not just for restaurants. You can also print your own customized menu for weddings & holiday meals as well as milestone events such as retirement dinners, anniversary & birthday parties. It´s a great way to make an event extra special.